okay, this is your FINAL warning. recap beginning. SPOILERS AHEAD. whew, are you ready for ALL THE FEELINGS? (i’m not.) chapter 22 begins with a scene between Nova and Adrian have a Moment™on the rooftop while they’re on watch. eventually, Adrian falls asleep (LAME) and Nova is left with her thoughts. she’s also getting antsy because she believes their job atm is useless (to an extent) AND because she’s slowly realizing Adrian is really hot echm. eventually, Nova sees some movement in the library (aka the place their spying on for Gene Cronin aka the Librarian) and wakes everyone up. Adrian sees Ingrid aka the Detonator in front of the library and they call backup. Nova doesn’t want the Librarian to be really revealed so she manages to convince everyone to enter the library themselves before waiting for more Renegades (for the sake of the civilians in the library). when they go in, the girl at the front seems dumbfounded and disappears through a mirror. then, Gene Cronin himself appears – insulted and appalled. he insists his innocence and invites them to take a tour of his office when DUN DUN DUN… The Detonator reveals herself and all of Cronin’s weapons he was hiding. internally, Nova is furiously screaming at Ingrid because this was not their plan. a fight ensues and… there’s a lot going on. Nova finds out the Ingrid didn’t talk to Gene the day before for their plan and instead decided to do her own thing without telling anyone (her own thing being: kill all the Renegades on their team). things go haywire. Nova shoots Ingird; a fire starts in the building; they find out a civilian is missing. Nova convinces everyone she can secure Ingrid outside and splits with the team. she has an argument with Ingrid about the whole situation but manages to let her go. Cronin is mourning about his lost archives when Ingrid appears again. the Sentinel stuns her, then asks for Nightmare’s identity once more. Cronin, hysterical at this point, is so close to revealing everything when Ingrid is back and shoots him. Cronin dies; Narcissa cries; Ingrid sets off another bomb and the Sentinel is flown off the roof. with just Nova and Ingrid left, Ingrid tells Nova she has to kill Narcissa to keep their secrets safe. instead, Nova lets Narcissa go, shoots Ingrid’s arm, and launches herself off the roof. back on the floor, the Sentinel is back and Nova is annoyed. they make smartass remarks at each other until Ruby and Oscar spot her. when she sees Adrian isn’t with them, she’s heartbroken. (i scream) she’s still angry at the Sentinel and tries to get any last bit of information from him, but he deflects and flies into the rubbish of the library. back with her team, Oscar is determined to run into the fire to find Adrian. but then, lo and behold, Captain Chromium finds that Adrian drew himself an igloo and was hiding in the library all along. *smirk* they recap the scene with Captain and agree to explain in detail the next day. Nova returns to their lair of the subway tunnels to find that they’re leaving. :((( Renegades are coming and the Anarchists are planning their escape. on their run, Leroy informs Ingrid that she’s no longer an Anarchist. he speeds himself and Honey to their temporary home, the address Nova put on her Renegades information sheet. Nova goes off on her own to contemplate everything. the next day, their team reports in front of the council exactly what happened the day before. they’re on probation for disobeying rules. at the end, Adrian requests to interview Winston Pratt, the Puppeteer, and Nova gets the job cataloging the weaponry. afterward, Adrian and Nova visit Max. Nova helps Max make his ~glass city~ a little more accurate and their conversation goes to what the council is doing to Max (confidential info), Max’s parents (dead, formerly part of the Roaches aka the group that killed Nova’s family), and Adrian’s mom (Lady Indomitable – a fact Nova didn’t know). midway through their conversation, Magpie delivers a message saying the council approved their request to interview Winston Pratt (that’ll be fun!!!!). a few days pass and nothing happens. Nova’s working in the weaponry department when she glances over at Max’s quarantine to see him levitating. she’s trying to figure out what’s going on, then Max spots her and loses his concentration. he falls on one of his glass buildings and gets severely hurt. Nova, panicking, runs into the quarantine and tries to help him. before she could do anything, Nova feels herself growing weaker by the second and faints. DUN DUN DUN. that’s the end of chapter 32! 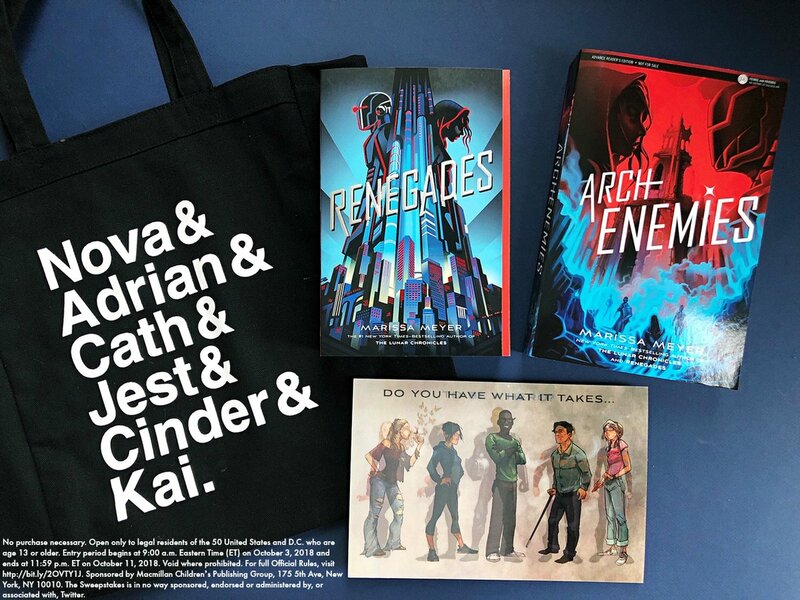 check emmabooks next week to read/watch the FINAL recap of Renegades before the release of Archenemies! must be 13 or older OR have your parent’s consent to release a mailing address. we (twirling pages & macmillan) are not responsible for anything lost in the mail. who’s your favorite character in Renegades? do you have any guesses on what might happen in Archenemies? let me know in the comments!